Noche Buena, or, Christmas Eve at Chez Elena will sparkle with all the music, aromas and joy of this special evening. A traditional Mexican dinner of Turkey and Mole with all the trimmings will be served from 6:00 – 11:00 as memories of Christmas pasts are revived. The beautiful and unique tree with it’s lighted flowers has become a time honoured seasonal tradition in this historic garden restaurant. You can also join us on Christmas Day for dinner. And join us on New Year's Eve for one of the best parties in Puerto Vallarta. Enjoy live music, a special menu (or a la carte if you'd prefer), no cover charge and prices to match the challenged economy. Dinner service is from 6:00 p.m. to midnight. Then, at midnight, watch the spectacular fireworks over Banderas Bay from our roof top terrace, El Nido. There isn't a better view of the Bay anywhere. We are very proud to announce that Chez Elena has been chosen from more than 8,500 international properties as Lanier Bed and Breakfast Best Restaurant. This lovely garden restaurant is quite often the setting of an intimate engagement dinner, anniversary or special birthday. Chez Elena caters to both small and large groups upon request, as well as private dinner parties, capable of serving as many as 100 people. The atmosphere here is undeniably romantic with its twinkling lights, flickering candles and intimate setting. 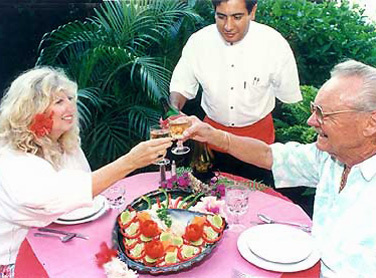 Consistently acclaimed for its scrupulous attention to freshness and unobtrusive professional service, the menu is nicely balanced between international and Mexican specialties. Sate Mixto, our signature dish among a venue of favourites, is always a delight for the adventurous palates. An Indonesian brochette of pork, beef and shrimp under a peanut sauce blended with various eastern spices and flavours, it is served with rice and seasonal vegetables. Seafood, several regional Mexican dishes, pork, chicken and beef are also on this small but well-chosen menu. At Chez Elena you'll find a price and selection sure to please everyone. 2010 © Chez Elena and Los Cuatro Vientos. All rights reserved.